What is a Catnip Blankie ? 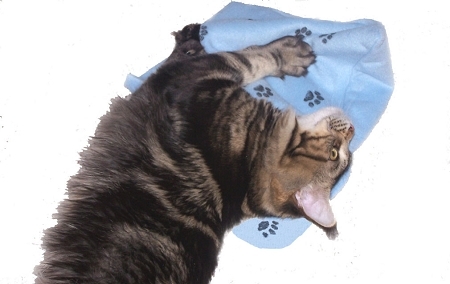 A Catnip Blankie is a special toy/mat filled with Catnip that's totally irresistible and will drive your kitty wild ! This "Blankie" will provide you with endless entertainment and your kitty with euphoric bliss. You may find that your kitty will spend their time laying on it, wrestling with it, pummeling it, sleeping on it and sometimes licking it. The 14" wide x 18" long Catnip Blankie/Mat has no loose fiberfill inside that could bunch up or shift. It's filled with just our own organically grown Catnip. 5 Cups to be Exact ! 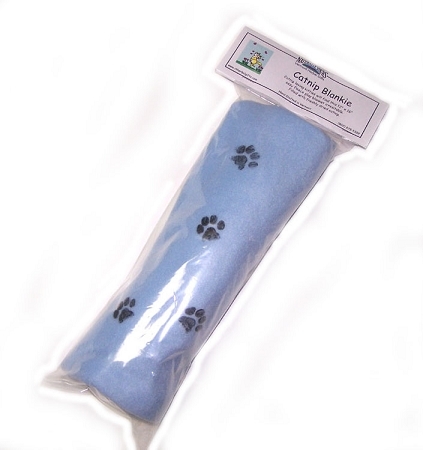 Handmade from Polar Fleece fabric, we hand print the Paw Prints tip toeing across the mat just as if your kitty stepped in wet paint ! cat hair magnet for places you would prefer not get covered with kitty hair. 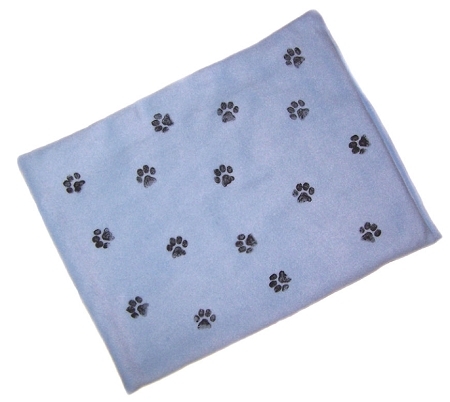 This Catnip Blankie is double stitched to make it strong and durable and the paw prints are printed with a non-toxic screen printing ink so it's not harmful to your kitty. 3 Fleece Colors with black paw prints. To Clean: Spot clean with a damp sponge or brush with a lint brush. Rolled up and packaged in a clear tube bag that includes a cute Catnip Blankie label. I met you last week at LARAC and I remember telling you that I knew I would regret only buying one. I wish I had cleaned you out! I came home to California last night and the cats immediately started clawing at my suitcase, they are obsessed with the mat, I keep having to take it away and hide it. We love it! My cats love the blankie! Bought these at a Craft Show. Cats went nuts.